Cappies Nominations and Awards for the 2018 Season! 2018 Cappies Award Recipient "The Titanic Band" for their achievements for "Best Orchestra." 2018 Cappies Award Recipients, Jack Griggs, Diego Maldonado, and JD Mayer, for their achievements for "Special Effects and Technology." 2018 Cappies Critic Team at the Cappies Gala for their nominated critics, critic team, and musical. 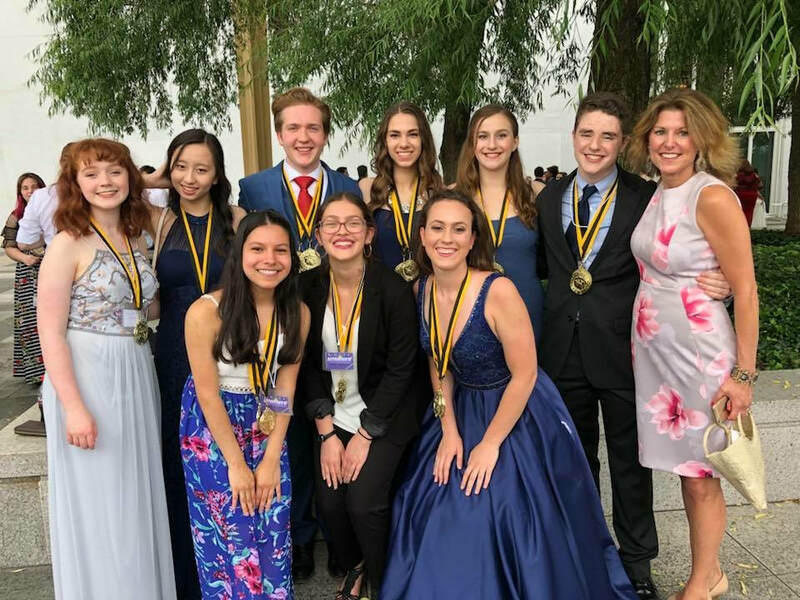 Back: Carolyn Best (Critics Team), Jessie Yu (Critics Team), Parker Waters (Lead Actor in a Musical), Maggie Klein (Bill Strauss Graduating Critic), Alexa Schwartzman (Critics Team), Joe Malone (Featured Actor), and Mrs. Gelinas (Best Musical, Titanic the Musical). Front: Vanessa Rivera (Maryland Theatre Guide Returning Critic), Emma Shacochis (Maryland Theatre Guide Returning Critic), and Lindsey Jacobson (Female Vocalist).